iPhone 5 to shift some controls to bezel? An Apple patent made public this week suggests that we could see the bezel put to good use on the upcoming iPhone 5. The patent details how visual indicators and touch-sensitive buttons could be incorporated to the space around the screen, referred to in the patent as 'side indicators'. Steve Jobs' original vision for the iPhone was that it would be completely buttonless, but this patent talks more about the on-screen buttons that users press to control apps and services. By moving these onscreen controls to the bezel, that valuable display real estate could be freed up. Instead, icons would be illuminated on the touch buttons when an action can be taken, leaving the screen free and clear, not to mention your fingers not obscuring the view. When not in use the icons would be invisible, leaving the bezel clean and stylish as on the iPhone 4 and the current iPad 2. One figure in the patent application shows the settings for the bezel controls, demonstrating that users would be able to turn the indicators on and off, as well as controlling the orientation and brightness. 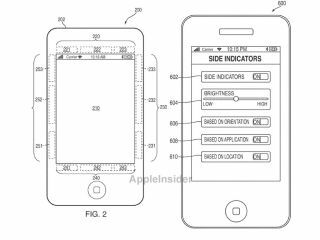 The patent was filed in 2009, so there's no guarantee that this functionality will make its way to the iPhone 5 – but some rumours suggest that Apple is looking at extending the screen size while keeping the device size the same: this patent could fit with those plans.